When greed becomes the currency of the human soul, the final balance ends in the red. Director Robert Bresson adapts Tolstoy’s THE FORGED COUPON, choosing to focus mostly on the first half of the story: Bresson’s concern is with the act and consequences, not epiphany and salvation. The film begins with a young boy asking for his allowance from his busy father. The boy asks for more to pay off a debt but the father dismisses the plea. In need of money, the boy trades his watch to a friend for a forged bank note; thus setting into motion the machinations of murder. 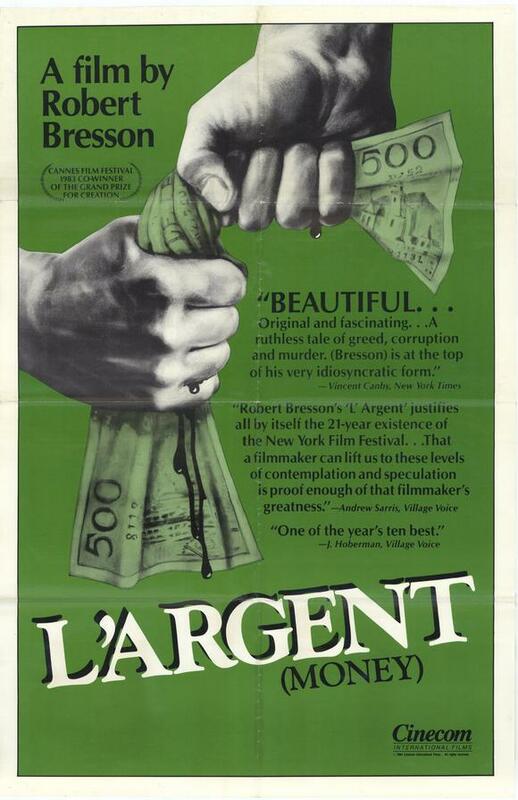 Bresson shows callous regard for human nature when values are replaced by dollar signs. Every character who touches the bank note becomes corrupted, as if the desire for profit was a deadly biological virus without a cure. Bresson depicts the boy, store clerk, store owners, and ultimately Yvon as superficially innocuous but ultimately debased. Each character has a chance to redeem themselves and speak the truth but are motivated by selfish desires or the fear of punishment. Yvon is convicted of the misdemeanor because others would not tell the truth: it is ironic that he bears the burden of innocence but falls the hardest. Contrast his fate with the store clerk who perjures at Yvon’s trial then burglarizes the business: he ends up wealthy and comfortable, buying forgiveness. Yvon loses everything; his wife and child, his freedom, and finally his soul. Unable to seek vengeance upon his accuser, he lashes out at society and ends up destroying the one person who offered him kindness. Bresson implies that this evil is inherent within every person and can awaken with the proper stimuli. The final shot reveals Yvon’s capture after the grisly murders, being led in handcuffs by the police. A crowd gathers for the spectacle and Yvon is marched away but the crowd doesn’t see him; they still search the empty doorway for enlightenment.